Kingsford, MI May 30, 2010 Nelson Paintballs. Nelson Paintballs provided assistance to the Michigan National Guard by sponsoring the Guards annual paintball game recruiting event. Rick Louys, President of Nelson Paintballs, said, "It was truly our pleasure to assist the National Guard in their recruiting efforts, and at the same time, make it possible to expose potential new players to the game of paintball. We generated a lot of interest from people that have never played before"
Nelson provided paintballs, markers, accessories, and air supplies for the daylong tournament put on by National Guard members. Nelson had staff on hand providing technical assistance and answering questions about paintball from participants. Nelson is the original inventor of the paintball, and has been selling paintballs since 1960. 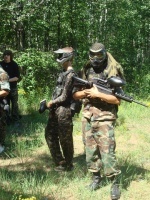 Nelson offers a full line of all-PEG-based recreational paintballs as well as other paintball equipment and accessories. Nelsons products include Anarchy, Special Forces, NelSplat, Hotspot, and Hemorrhage brands, as well as clear training projectiles, red-colored fill training projectiles, tactical projectiles, and custom encapsulation projects. Paintball sizes sold include .68 caliber, .62 caliber, .43 caliber, .40 caliber, and 6 MM in multiple shell and fill colors.